Stonehedge was contacted by Trish Gardner during the planning stage of her residential build on Kendalls Beach at Kiama. Some 80 tonne of stone was needed to help make her dream a reality. Little did we know at this stage that a pot of gold sat beneath the surface. Upon excavation of the site, we discovered truckloads of Kiama Basalt perfect for this project and set about bringing this dream into fruition. A dry look fireplace in the main living area was constructed along with extensive retaining walls and planters that Trish says helps to ground the building and tie in with the heritage of the area. A modern design gave an old home a new facelift combining the stonework of masons in the 1960,s style with an architectural twist. 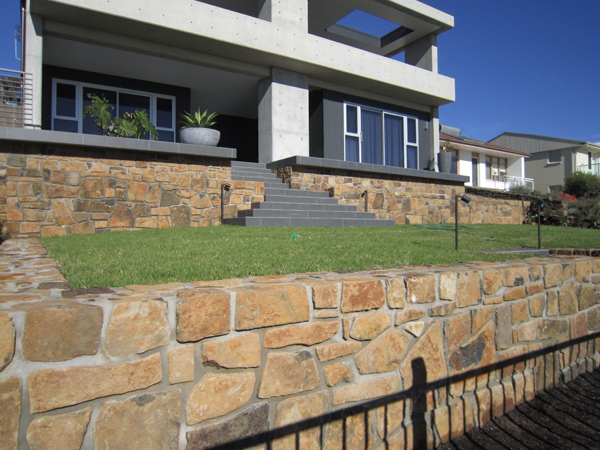 Some 35 tonne of stone was used to create this retaining/feature driveway wall complete with plantar. Very effective, the planting aids in softening the mass of stone. The building site as it looks during construction. Good planning by Stonehedge means we can work in the smallest of residential sites where the safety of all involved is paramount.